JM collection turquoise blouse petite lace fastening turn up sleeve. Condition is Used. Dispatched with Royal Mail 2nd Class. very good clean condition. cotton. only worn once. BLOUSE/ TOP/TUNIC/ KURTA. 100%COTTON. ENDING SOON. NEW ARRIVALS. ADD US TO YOUR FAVORITES. Elephant Statue. Wall Hanging. 100% cotton with silk trim to collar and hem. Crinkle/cheesecloth style material. DKNY JEANS NAVY BLUE 100% COTTON T-SHIRT TOP Size UK S Pit to Pit is 18" approx 45 cm BNWT With details at the hip, Relaxed fit. Armpit to armpit 23". length from shoulder 24". Lovely ladies top. in very good used condition. Gap Cotton White Top. Small-Petite Size. Condition is pre-owned but looks really good condition. But clothes from Gap are always good and show a distinctive dress sense of quality. Check out all the photos as I have tried to cover every angle to show the high quality this top is. All ready for spring are you?. Well here is a blouse that will take you wherever you are going dressed up or down it really is a gift. Do not miss this one. Next Petite White Cotton Lace Trim Blouse Size 18. New without tags. From a smoke free home. COS LADIES TOP SIZE XS SIZE XS, PIT-PIT 18 INCHES, LENGHT 23 INCHES PLEASE MEASURE AND COMPARE TO SIMILAR FITTING TOP. IN VERY GOOD CONDITION NO HOLES OR MARKS ETC. MACHINE WASHABLE ANY QUESTIONS WELCOME. Fabulous Blue & White Stripe Blouse with Cut-out design around hemline and 3/4 Frill Sleeves. Size UK 12P. Blue and White. Length from pit down side seam 15". Precis Petite Red Jersey Top Size M New With Tags. Condition is New with tags. I am a size 12 and this fitted. The length of the sleeves is 12 inches. Unneeded gift. Dispatched with Royal Mail 2nd Class. 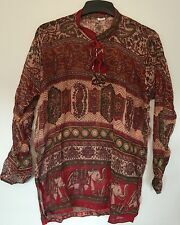 Stunning wine red blouse, top size 10. Features beautiful crochet embroidered accents with a keyhole button back closure. Length from pit 16.5". Teal Green Stylised Floral Pattern. UK 14 ~ Petite. Lovely Stretch Jersey Top. Self tie half belt. BHS PETITE . BRUNSWICK SHIRT/BLOUSE. & Pleat Detail on Bodice. 70% Cotton 27% Polyester 3% Elastane. FRENCH CONNECTION DARK NAVY/WHITE STRIPED COTTON TOP/DRESS SIZE 6. LENGTH REAR COLLAR TO HEM 31". WORN ONCE-PERFECT CONDITION. Womens Cotton Check Summer Shirt. Size is petit XL but this was bought in America. I am a medium and it fit perfectly. Loose box fit at the waist. Excellent condition.